MARGAO: The message to the panchayat, Town and Country Planning (TCP) department and the Rahejas is loud and clear; Carmona village will not allow the proposed housing project, come what may. 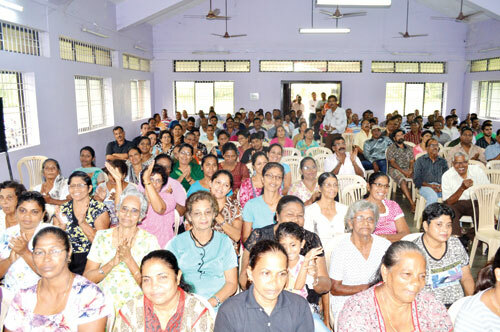 The village committee organised a public meeting at Carmona on Sunday to discuss the issue. The meeting saw many activists and leaders encourage the locals to unite and fight everyone in favour of the Raheja project. Some of the speakers included Dr Francisco Colaco, Fr Eremito Rebello, Fr Savio Fernandes, and Fr Maverick Fernandes. The locals resolved to take legal opinion and convey their decision to oppose the project to the panchayat at the gram sabha on September 13. They also requested that the gram sabha be shifted from the panchayat hall to a bigger area as hundreds of villagers were expected to attend the same. Fr Eremito stated that if the panch members, including deputy sarpanch Orlando Da Silva, were honest and sincere, they should follow their conscience, resign on moral grounds, and join the villagers in their fights against the Rahejas. His statement, which drew a resounding cheer from the crowd, was made in rebuttal of the panchayat and Orlando’s stance that the panchayat were legally compelled to grant a construction licence to the builder. Fr Eremito asked the panch members to step down immediately if they could not find ways to oppose the project, which the whole village was against. He also recalled how the people had managed to ward off the Rahejas during the anti-SEZ campaign and exhorted the villagers to show the government and Rahejas their might. Fr Savio Fernandes of Council for Social Peace and Justice criticised the government for making tailor-made policies and amending laws to suit projects that faced opposition in the past. He remarked that the project would harm, but not benefit the locals. Activist Judith Almeida questioned how the Electricity Department could give a NOC for the Raheja project when the village infrastructure could not accommodate it. She stated that the villagers would suffer as the units in Raheja would drain the village’s power resources. Locals Anthony D’Silva and Socorro Miranda said the panchayat’s reasons for giving the construction licence were dubious and went on to explain how the panchayat was trying to misguide the public. Soccoro claimed Raheja would build 550 apartments and then try to buy land in the neighbouring areas, while D’Silva claimed the survey plan was faulty. The latter accused the panchayat and TCP of turning a blind eye to the anomalies in the Raheja file and questioned how permission could have still been granted. Miranda also described a scenario in which the original Carmona residents would be minority once the project was completed. Cavelossim local Iris Passanha recalled how they had successfully fought against real estate projects in the court. He stated that there was enough room from a legal perspective to deny the Rahejas permission. He added that one of the pre-conditions under law was the demarcation of a garbage management system in the village. He questioned how the panchayat could give permission for the project in the system’s absence. Locals Ernesto Moraes and Avinash Tavares urged the villagers to stand united and stated that the Raheja project would not be the last one they would be opposing. He also urged the villagers to educate themselves on the law to be prepared for future cases and to support other villagers. Moraes added the government could not impose decisions against the people’s wishes. Cansaulim activists urged the villagers to attend not only the gram sabha meetings, but the panchayat monthly meetings. Other speakers said this case would be a landmark if Carmona could successfully fight against the project. To conclude the marathon meeting, village committee president Blaire Rodrigues criticised the panchayat for not listening to the villagers and stated that there was no purpose in the panchayat forming village committees if it could not support the villagers’ agitation.